This is the most exciting map in Chicago. But the bottom line is LOOK AT ALL THOSE RAIL LINES. Especially on the South Side and Northwest Side. The amount of rail infrastructure in Chicago is just incredible – almost as incredible as how badly we squander it. There is no good reason why all those lines shouldn’t be as powerful a connective tool as the El. 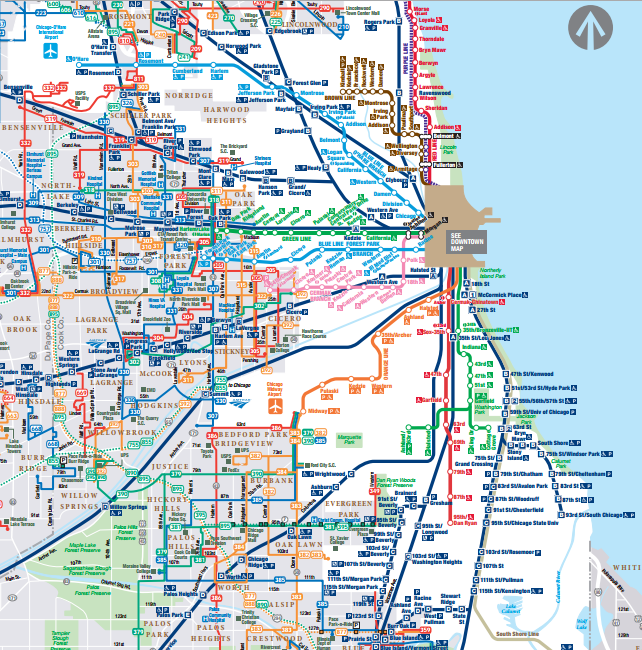 If you’re reading this blog, you’ve probably heard of the Gray Line, but that proposal almost misses the point: Metra as a whole should be a useful mass transit network for everyone living or working near one of its stations. 1. In the city and near suburbs, peak frequency should be reliably 10 minutes or less, and off-peak should be 10-20. 2. In the city, fares should never be more than $2.25, or whatever the cost of an El trip is. 4. A CTA-Metra transfer shouldn’t be any more expensive than a CTA-CTA transfer. 5. As with El stops, it ought to be legal to build very densely around Metra stations in very desirable areas. Must places like downtown Wilmette or Oak Park remain frozen in amber as if nothing had changed since 1920? They must not. Let people live where they want. None of these are original ideas on my part, but it would be nice if they would become generalized conventional wisdom throughout the city. The potential for increased mobility (and all that means) is really stunning. Next Next post: Housing affordability: distribution and quality matters. Any input, suggestions, or promotion to people with some Power, would be greatly appreciated. No problem! Thanks for your work.